2015 Rehabilitation and restoration of the year winner from the Historic Staunton Foundation. Original and restored floors, maple cabinets, granite counter tops. 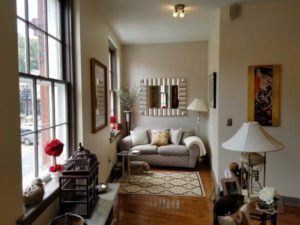 3 bedrooms and 2 full baths, lots of natural lights and high ceilings. 2 living rooms with an open floor plan. 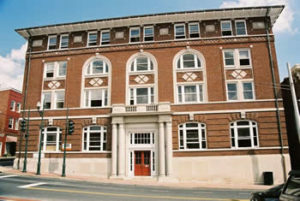 Live downtown and walk to everything that Staunton has to offer! 702 West Beverley: 2880 sq. ft , 3 levels with a retail, ground floor with parking and space for two large apartments upstairs. Access for the apartments is by way of an entry porch at the rear of the building. The ground floor shell condition with the upper floors being laid out in a basic apartment format. The ground floor is masonry with a typical store front entry, the upper floors are of frame construction. $225,000. 708 West Beverley: This townhouse building was designed by T. Collins, built in 1912 and contains 3 separate masonry units. Each contains 4 bedrooms, 2 baths, living room, dining room, kitchen, large entry foyer, basement and walk-up attic with bonus room. Large pocket doors, tall ceilings and original windows are just some of the original amenities. These properties offer off street parking. All are ready to be completed. $575,000. 803 West Beverley : Located in the Newtown Section of Staunton, this property is ready for completion. Zoned B-1 with over 2,000 sq. ft., this property can be a single family home, a duplex with two units, or a retail store with apartments above. There are 3 lots with the property that include off street parking with three accesses.$170,000. This well maintained setting offers a distinctive property situated on top of a hill. 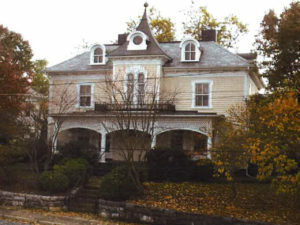 The main house was built in 1893 and divided into two identical units. In addition to the main residence, there is a detached one bedroom cottage atop a two bay garage. Recent improvements include an engineered slate, metal, and rubberized roof in 2013 and new paint in 2014. 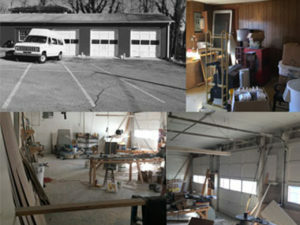 This unit (zoned B2) is located just outside of Downtown Staunton next to Paris Cake Company and The Shack. It features a large area which could be used as a workshop (currently used by a cabinet maker) but with some vision could be transformed to just about anything. e a single family home, a duplex with two units, or a retail store with apartments above. There are 3 lots with the property that include off street parking with three accesses.$170,000. Steps from the shops and restaurants on East Beverley Street, this unfinished shell in the historic Old Y Building provides the ideal “Live Work” space for any small business. The unit is wired for multiple workstations, has a separate street entrance, and can be adapted to meet the needs of the purchaser.